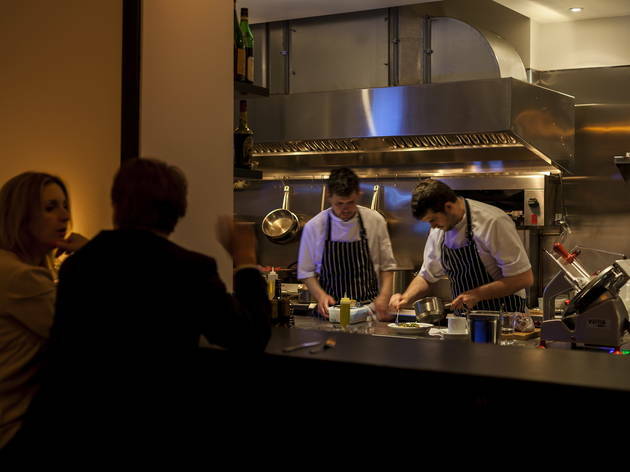 A heartfelt Highbury operation, Italian- and French-accented seasonal British ingredients - a trek to get to, and no bookings taken, but worth the gamble. Note from Time Out's Food & Drink Editors: Since this review was written, Primeur has acquired a phone number. 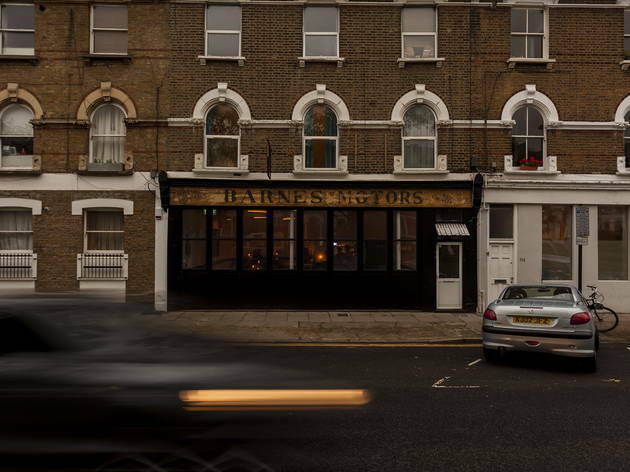 'Barnes Motors’ announces the overhead signage, indicating the building’s former life. The frontage of black-painted folding doors with wire-reinforced glass still resembles a drive-in garage, maybe somewhere you’d bring your swag-stuffed getaway car for a respray. But despite their ominous appearance, these doors can open wide, revealing the interior to the leafy street. 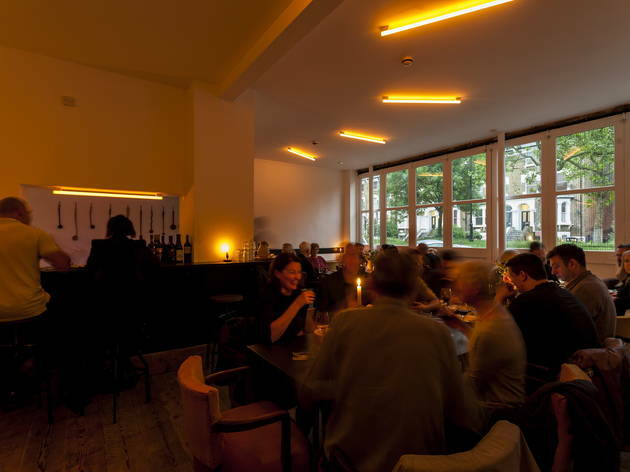 Inside, the place is pristine and painted white; though the open kitchen contains so much shiny steel you wonder if the staff can still do a bit of panel-beating and priming on the side. The much smaller sign ‘Primeur’ refers not to paint, but to wine. Investors buy young casks of wine ‘en primeur’, years before it’s bottled, in the hope that the contents will mature into something vauable and sought-after. It’s as much an act of faith as good judgement. Primeur the restaurant also requires an act of faith. There is no phone number, it’s a 15-minute walk from the nearest station, and this residential area has few dining alternatives if you don’t manage to get in. Yet Primeur is a gamble worth taking. 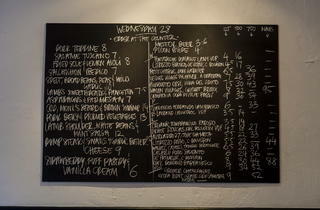 A solitary blackboard menu lists the day’s dishes: Italian- and French-accented but with seasonal British ingredients at their core. 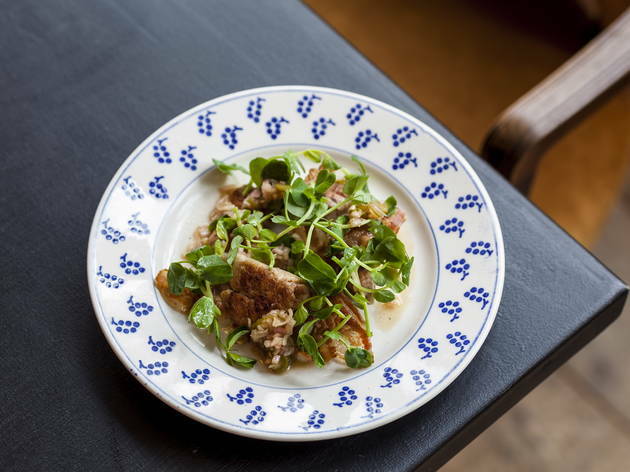 Pan-fried lamb sweetbreads were seared then crumbled like cauliflower florets, their richness cut with a sharp dressing then topped with crisp pancetta and pea shoots to vary the texture. Equally masterful was a fillet of cod, garnished with brown shrimps, cucumber dice and savoury pan juices. A third dish confirmed where this kitchen’s strength lies. Spelt was cooked like risotto, the grains served with broad beans. It’s simple food, the sort you want to eat, but not at all showy. Primeur’s a heartfelt operation with a passion for wine and a lot of thought put into using the suppliers that matter: crusty sourdough loaves from Bridget Hugo’s Bread Bread bakery, runny French cheeses from importer Mons. 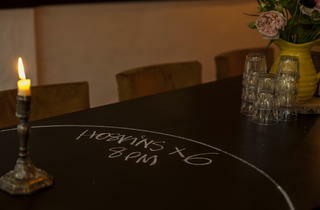 From the hundred-bin cellar, staff pick a dozen or so wines for the day’s blackboard list, many sold by the glass. We recommend tasting before committing, as some of the ‘minimal intervention’ wines are wild cards. Our glass of Litrozzo natural wine tasted of cider but was replaced with good grace. 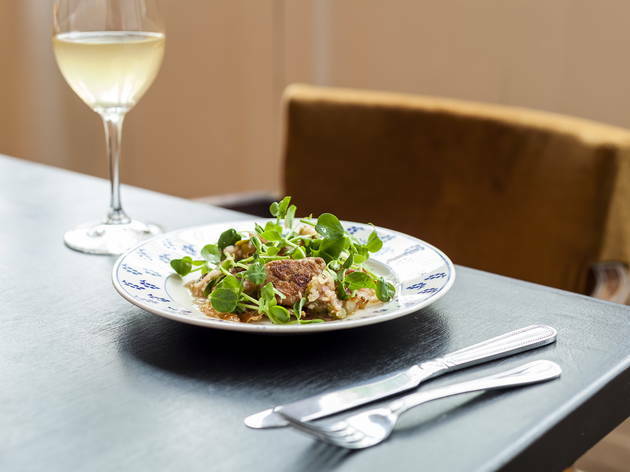 Primeur appears to be a smarter investment than many: it passes its MOT with no advisories, and is already showing signs of becoming – among Highbury eateries – a very nice little runner. 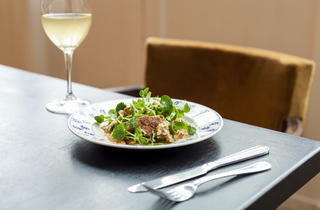 Meal for two with wine and service: around £95. Waiter: Let me check for you (disappears). The barman says nobody else has sent any back so it can't be bad. Me: Oh, well could you tell me what grape it is? Waiter: It's 100% Cortese grape. It's a real classic Cortese wine. Me: That's a white wine grape, this is red wine. Aside from the snootiness of the staff I thought the food was pretty unadventurous and overpriced. If you can get in the food and wine may be good, who knows but the up their own arse attitude put us off when we went there. The cocky manager was sneering and unhelpful and the refectory style tables were not appealing . We did not have reservations but asked if there were any available places and were directed to 3 vacant spaces at the corner of a table, once seated we prepared to order only to be told service did not start for another hour, we left. My fav neighborhood restaurant - daily menus, fresh, local, in season ingredients, everything is delicious. ... and I know it's just bread, but the bread they give you when you first sit down is AMAZING. Cute in the summer as they would open up the garage door so you are facing the outside. 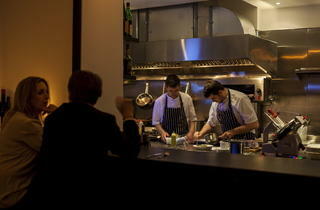 Delicious and innovative food, lovely people and great wines. Feels like you're in Paris, a secret spot in London. My favourite place in London! 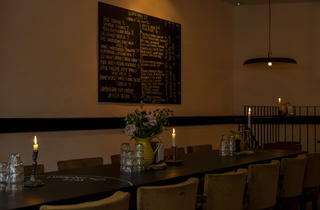 Stunning food, great atmosphere. Perfect. LOVE this place. Fantastic food and wine! 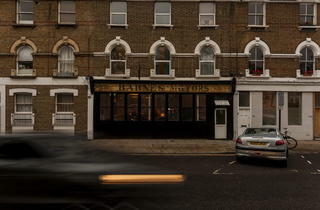 The perfect neighbourhood restaurant in an idyllic tree lined street. Unique setting in an old 1930's garage. The hum and buzz of the room on a Friday and Saturday night is fantastic. 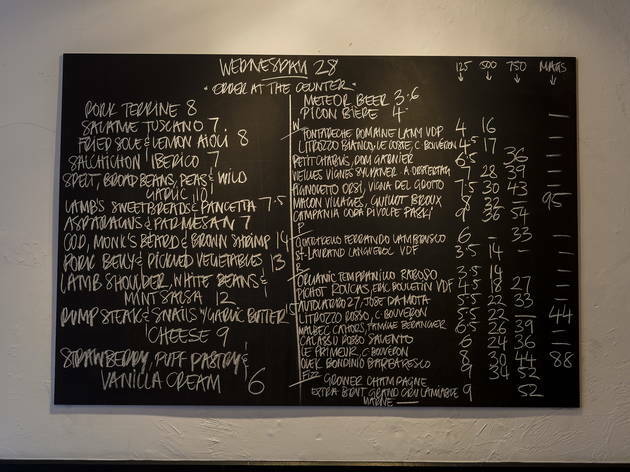 Great food, constantly changing and brilliant wine list, with everything chalked up on the blackboard. Surely not that much of a trek - with Canonbury Overground Station approx. 350 metres to the immediate south it's a simple and short walk along the course of the New River; also check out the 341 and 141 bus routes!! The food is so good we keep going back, sometimes service is great, when the manager is not there mainy, unsurprisingly he's the rude one! 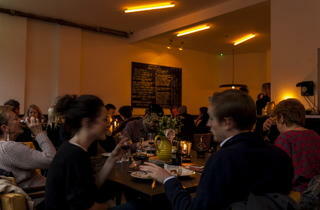 But having heard that the waiting staff don't see any of the tips or service we will not be returning. Seriously shocked to learn this. Maybe we'll return when the government introduces legislation on tipping. Absolutely fantastic food - well worth the walk! Wow with a capital W. I love this place. My sister decided to hold her birthday here and begrudgingly we all trekked up to North London for it. We had the amazing downstairs private room, which seats I think 8-10. I believe you have to actually go in to reserve a table (which is annoying, but at least guarantees people really, really want to go). 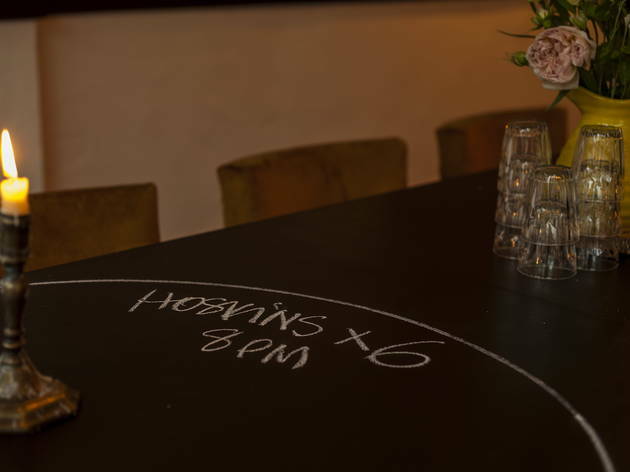 If you're organising a special dinner, the downstairs round table is really fun. You can bring your own old school vinyl and play your own tunes. The upstairs (where the public restaurant is) is also really nice - very busy and has that kind of lazy, shabby chic, kind of romantic vibe. The food that we had here was amazing - we had big sharing platters of antipasti to start, and then even bigger sharing platters for the mains - piles of roast chicken, leeks and the best cauliflower cheese I have ever had (sorry Mum, it's wayyyyy better than yours). The pudding was just as good. I felt so full I could have died, that's my only complaint. I love it here. Everyone should get the chance to go. Best of all, it's not even that expensive (unless you have a million drinks, like we did, in which case, you won't care). Just excellent. Delicious food. Lovely room. Staff fine. I'm surprised to read such bad reviews as, on both times with went there, we had gorgeous food, lovely wine and attentive service. 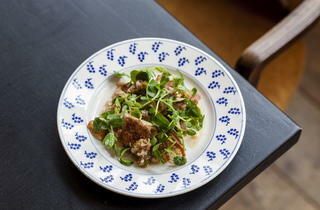 Think tapas, small sharing plates to nibble on with a good drink and nice company. We will definitely be back. Firstly, the food is REALLY good here. However, the negatives have tinged our experience at Primeur. Firstly, it was so cold in the restaurant despite the heaters being on. We had to keep our coats on (and baby’s entire pram suit on). 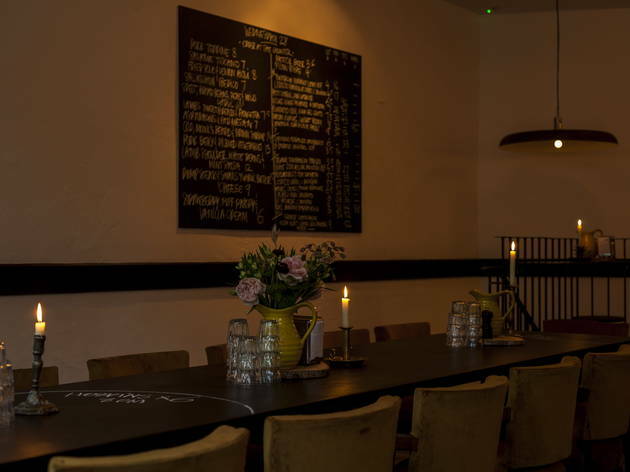 The restaurant is a converted car garage but that’s no excuse. Secondly, the portions are small. We are not big eaters but we felt hungry afterwards - main dishes came with zero carbs. Also, my razor clams were tasty but gritty with sand. Pricey for a neighbourhood restaurant. Lastly, bizarre booking system: I had to ‘tweet’ them via twitter to get a reservation! blend food, lack of taste. ordered a bottle of italian wine which was a similar experience is "AT" below. def not worth the long travel for bad food. 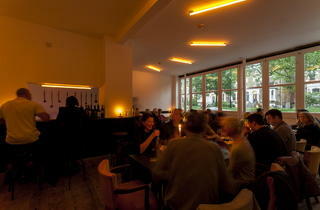 Lovely atmosphere, good service, nice wine and most importantly, delicious food. 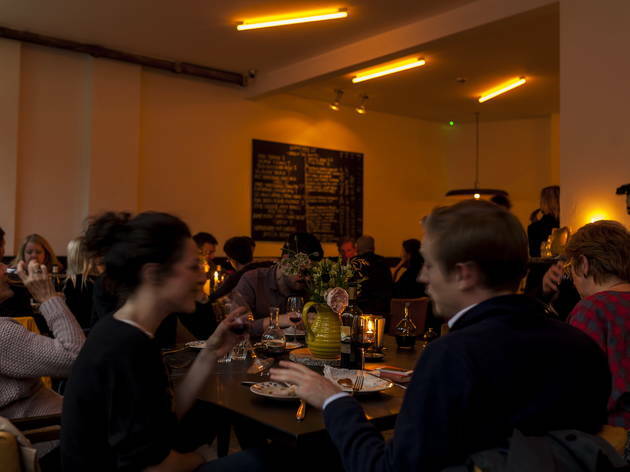 The fact you can't reserve a table is irritating but once you get in, it's a treat! I rarely leave reviews but I thought those one star reviews were surprising and nothing like our experience of the place, so hopefully this balances things out a bit. This place is a bit of a treat, but well worth it. Two of us ordered four main dishes and shared them. Each one was more delicious than the other, absolutely gorgeous. They're quite busy but if you actually get a seat the service is good. We came in starving and the place was packed full but they managed to serve us bread, wine and food in good time and we left with a big smile on our face and happy tummies. Will definitely go again when I want to indulge and cheer up my taste buds.